Your First Choice for First Aid CPR AED & Emergency Management Solutions | Making first aid a part of everybody's life. First Aid to Save A Life provide first aid trainings & consultancy services to establish, implement and maintain emergency management systems. First Aid to Save A Life (FATSAL) provides a range of training (accredited and un-accredited) programs. 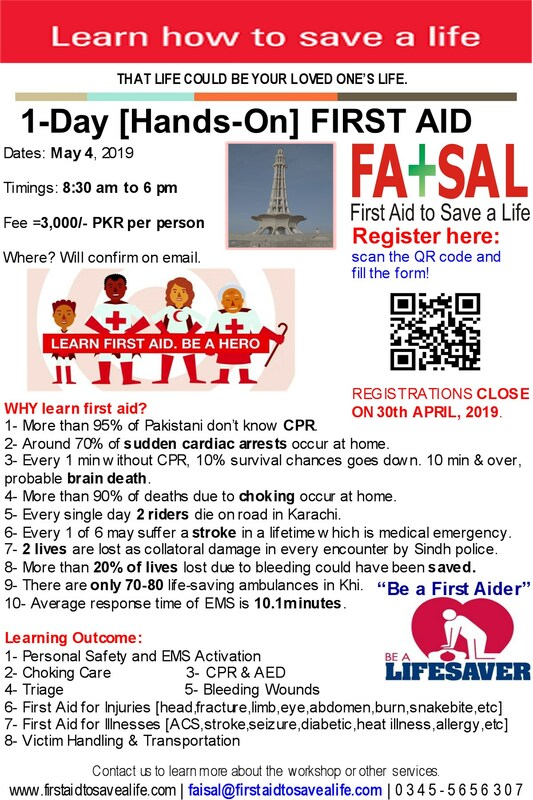 FATSAL is an approved and registered training center by MEDIC First Aid International & ASHI in Pakistan and is the pioneer training center in Pakistan to conduct accredited training programs. Are you looking for training programs for your company or organization? FATSAL is the best option for your training needs. FATSAL offers a wide range of Registered Training Programs such as CPR, First Aid, Bloodborne Pathogens, CarePlus CPR and AED for Adult, Children and Infants, AED Trainings, Oxygen First Aid for Emergencies, Snakebite First Aid, Advanced First Aid, Basic Trauma Life Support (BTLS), Basic Life Support (BLS), Advance Bleeding Control, those are taught by authorized and certified instructors. Expertise: Our training team’s expertise speaks for itself. Highly qualified and with extensive hands-on experience, each trainer is a specialist in their field and brings a real life dimension to a delegate’s learning. Inexpensive: Our exceptional value ensures you can save substantial amount as compared to other training providers in Pakistan. Engagement – Participants find our trainings’ engaging. The continuous attention and interest is generated by encouraging lively hands-on participation, providing mental challenges and varied delivery formats all leading to a stream of insights on the topic. Adaptation – We ensure that we match the depth of the material to the current level of the participants and proceed at a pace that is moderately challenging. Simplicity – No matter how complex the material, we deliver it with a simple structure that is easy to absorb. Research: Latest concepts, tools, techniques, tried and tested methods. Interactive: Just the right number of participants with group exercises, role-plays and feedback. Applicability: Training relevant to your needs and workplace requirements. Environment – Low-stress training with user-friendly materials and positive coaching. A proven “seeing, hearing, doing, speaking, feeling” approach to learning. Tools – We include effective and quick revision tools that can be used back in the office/leisure and stored in wallet.